We were very lucky to have been given the opportunity to review the Renault Twizy, so upon arrival at Bristo’s Ipswich we were really looking forward to trying out the full sized family friendly electric car from Renault. We are of course referring to the Zoe. The Zoe is a striking car to say the least. It’s blue hints give it a futuristic feel. The Zoe is a striking car to look at. Having being designed and built from the ground up run on electricity alone, it is a real show-stopper. Modern looks with cool blue accents on the front and rear lights coupled with a sleek aerodynamic body, this car looks futuristic not too ahead of the curve to look ridiculous, more Bladerunner than Jetsons. The car was parked in it’s very own bay at Bristos, distinguished by its British Gas / Renault ZE charging point. 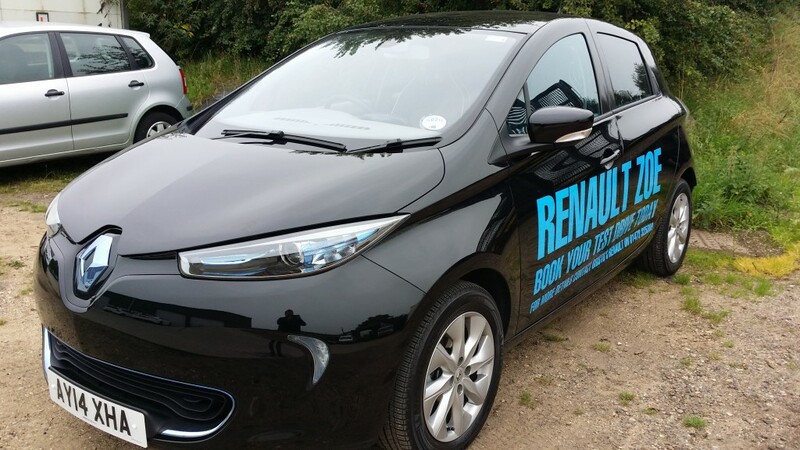 Renault have partnered in the UK with British Gas, who in turn will be installing charging points at Zoe buyers homes at no cost. If you don’t want to buy an electric car, but want to future proof and in turn increase your property value you can current pay a small fee to British Gas who will install a charging point ready for a future EV purchase. The centre console provides a large screen to display TomTom Live satnav directions and reversing camera view. You can also monitor the power distribution during your journey. Peter Frost; Bristo’s electric vehicle specialist gave me a briefing on the operation of the vehicle, demonstrating the central locking system, onboard computer and how insanely quiet it is. The car has two displays, the main dashboard display and secondary centre console mounted control unit and information display. The centre console display Satellite Navigation (TomTom Live), Radio, Media, Phone Integration and information on power distribution. Peter has provided the music in the form of a USB drive, the was also an SD Card which stored the maps for the satellite navigation system. Starting the car is simple, you depress the foot brake and press the START/STOP button until the car bursts into life. There is no engine noise (as there is no engine), but startup sound is played which is like a whooshing sound and the dash board lights up to confirm all systems are ready. The car is operated the same as a regular automatic which D, N, R and P with the addition of an ECO button which I assume reduces the output of the battery thus giving you more range. The ECO button changes the display colour scheme to green, reminding you that you are being more economical. I didn’t drive the car in this mode however, so I don’t know what difference it would make to performance. To move forward, again I engaged the foot brake (something I am used to with out Espace), released the hand brake, slid the gear selector into drive and pulled away as I would in any auto. The car gently and silently eases forward without touching the accelerator much as you would experience in a standard automatic car. I would assume this is to enable pulling away on hills by using the electric motor as a brake on slopes and stopping you rolling backwards. As you pull away, you are immediately aware just how quiet this car is, in actual fact it isn’t as quiet as it could be due to the pedestrian warning sound which is switched on by default. Switch this off, and you are truly silent at low speeds. The warning sound only sounds up until 17mph. This would be marvellous when you need to arrive or leave your home during the night as you not going to be disturbing your neighbours. The acceleration of the Zoe is something that you won’t be prepared for. The electric motor provides continuous power from a complete standstill, propelling the car to 60mph in around 13 seconds, it did feel a lot quicker than this because there is no gear changing and became a discussion point in the office as I thought it was much faster than this. Don’t expect it to outperform a Jaguar XF or VW Polo GTI, but it still holds it own with lesser vehicles. Top speed is around 85mph and a full charge will give you a range of about 120 miles. The car is very high specification inside and came with nicely upholstered seats and lots of other goodies such as a reversing camera. This was the top of the range model and as such has lovely alloy wheels which add to it’s appeal. Rather than produce a radically different design, Renault chose to adhere to the familiarity of their current range. This was a good move in my opinion, as being too radical can also turn people off cars, a bit like ‘uncanny valley syndrome’. The car simply looks great. Driving the car is very simple, especially if you are familiar with driving automatics. Simply depress the foot brake, engage drive and gently pull away by pressing the accelerator. There is no creep (the car gently moving forward whilst in drive), although the car will hold itself on an incline, so you wont roll backwards at junctions. Something you may not be prepared for is the ‘regenerative braking’ effect. What this means is that the normal de-acceleration you experience in a petrol or diesel (or engine braking) is not felt in this car, instead there is a noticeable amount of braking when taking your foot from the accelerator. This is because the car is reclaiming the kinetic energy normally wasted in braking and using it to put the energy back into the battery. It’s a little unnerving at first, but you soon get used to it. The car gives very good range of approximately 120 miles per charge, but you should keep an eye on the dashboard as hard driving is going to reduce the range. 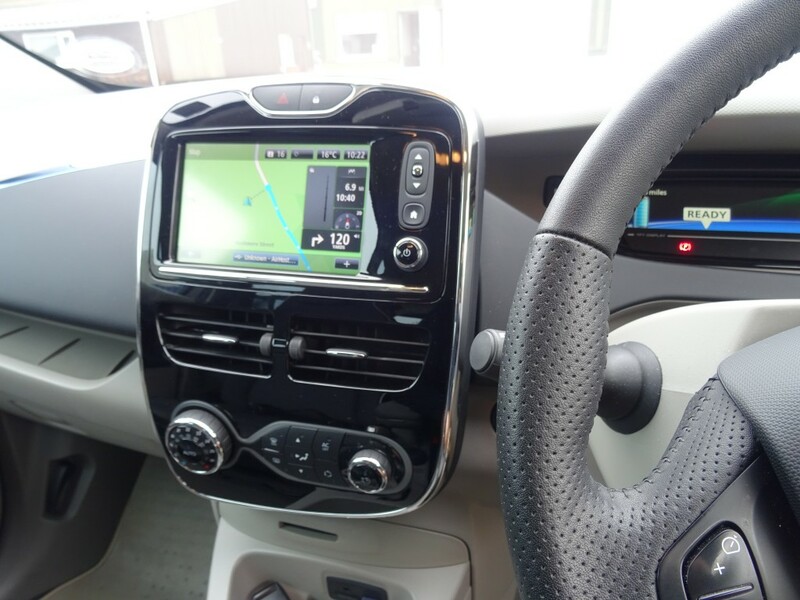 Luckily the car includes a feature on it’s navigation system which shows you where the nearest charge point, so if you get stuck you can find one. The car will charge to 80% capacity in 30 minutes and with Waitrose currently offering free charging points, nipping in to do your shopping and giving the car a quick charge is a pretty cost effective way of ‘fueling’ your car. As with the Twizy, Renault require you to lease the battery from them, in this case for around £75 per month, but this includes roadside assistance and other additions. If you come to sell the car, you will need to transfer the lease to the new owner, which might prove a problem. The car is capable of sensible motorway speeds and is therefore a real option as a main car. However it won’t get you further than 120 miles between charges, so if you need a car for extensive travel, the Zoe is probably not for you. I thought the Zoe was a great car, I really like electric vehicles and the Zoe was a brilliant example of an intelligently built car. The Zoe is a fabulous car and a real contender for your daily driver. It’s a head turner, but not shockingly so. Renault will install a charge point at your home to make live easier for you and it’s sooooo quiet. We loved it. We own a Zoe and for us it is the ideal car. Around town it is the perfect solution and an absolute pleasure to drive. For longer journeys you have to plan your route for chargers and allow charging time. The range is usually around 90 miles, depending on usage, temperature, driving conditions etc and 7kW chargers like those at Waitrose e.g. take around two hours for a decent charge, giving time for a meal , shopping or sight-seeing. The 22kW chargers like that at Bristo’s would halve that time at least. On the main motorways and at stores such as Ikea the 43kW chargers will give a useful charge in around 30 mins and more of these are promised by Ecotricity for the A12 and A14 in this area. If you should run out of “juice” a rescue plan is built into the package and the AA will take you to the nearest working charger. We have found Peter and his team to be most helpful and enthusiastic in supporting EV’s and Zoe in particular. For us, the future is here! Thanks for your comments, your information about charging points is very useful to know and I will mention it next week on the radio slot when I chat about the BMW i8. Peter is indeed a very helpful chap and was very helpful providing us with demonstration vehicles. Completely agree with your sentiments about the future, EV’s are the future today!